Box 899 Boissevain, MB R0K 0E0. Anna Grace Diehl (née Wall) was born December 6, 1937, to Robert and Laura Wall of Ninga, and named for her two grandmothers. Her whole life has been enriched by close relationships with family and friends. The eldest of thirteen, she grew up knowing how to find joy in little things—picking berries, riding bikes, dancing, sewing, making fudge with fresh cream, and caring for others. As a young woman, she taught in the north, then in rural schools, before settling down to create a family of her own with the handsome love of her life, Les Diehl. Together Anna Grace and Les had four children: Cheryl Lynn, who died in her first year, Charlene, Heather, and Michael, and each of them was supported with an enviable mixture of good humour and high expectations. The couple also provided a welcoming home for many of Anna Grace’s siblings, for several nieces and nephews, for exchange students from northern Manitoba, India, and Mauritius, and for young friends who benefited from a helping hand. Their circle included the Nguyen family from Vietnam in the 1980s, and most recently Mom’s beloved Eritrean family who are now putting down roots in Boissevain. It’s almost impossible to catalogue Anna Grace’s passions. 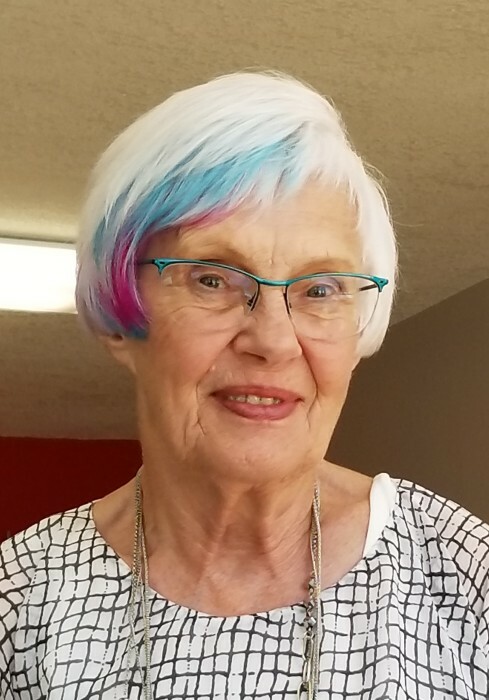 She was a lifelong reader, thinker, and teacher, and spent several decades at the helm of the Boissevain & Morton Regional Library. Under her care, the library frequently hosted exhibits of arts and hobbies as well as a spring riot of tulips, and also came to house the local archives, as well as the Moncur Gallery, an important collection of Indigenous artifacts from the area. She was committed to her United Church community, including lifelong friendships with “Unit 5,” her UCW group. When her husband Les died in 2009, she stepped into his spot on the Boissevain Recycling team, and took great satisfaction in providing stewardship for the environment. She spearheaded the work toward establishing the Palliative Care unit at the Boissevain Hospital, and spent many hours over the last decades quietly accompanying people as they made their last journeys. She was an avid gardener, and every summer the kitchen was a hive of activity as she prepared and preserved vegetables and fruits to last through the winter. She loved to be outside, and was always marveling over birdsong and flowers, whether peddling her bike along country roads (into her 80s) or sitting with her tea in her quiet back yard. She was rooted in her lovely home, but was also quick to embrace opportunities to explore. She had proudly set foot in every Canadian province and territory (including several with a tent in the trunk), she biked with Les through French wine country (with a cast on her broken wrist), and soaked up the special magic of Portugal, Mexico, Iceland, England, and her ancestral Scotland. She poured her time into quilts for her children, grandchildren, and nieces and nephews, transforming scraps into impressive works of art. She was a wonderful writer, sharing observations and insights warmly in letters and emails—and, in her last decade, texts. She was as comfortable wielding a hammer as she was sailing across the dance floor with her beloved. She claimed to not enjoy cooking, but made the best bread and pie ever, and was experimenting with new cuisines up to the end. She was an excellent conversationalist, always curious about the lives of others, and she sustained rich friendships with people of all ages and walks of life, from across the country and beyond, as well as in Boissevain, her heart’s home. She was modest, serious, efficient, surprisingly shy, ridiculously productive, and deeply principled. She had an infectious smile and genuine kindness. She dreamed of an inclusive world, and was respectful to all. In the midst of a typically busy week this April, she suffered an aneurysm, and was rushed to hospital. Over the next days, she had some surprising lucid moments where she shared her warm smile and kindness with people she loved, then drifted into a peaceful sleep in the Palliative Care Room she had worked so hard to create. Before dawn on April 10, with her family around her, she slipped away quietly to join her dance partner. She is held close in memory and love by her daughter Charlene and children Liam and Anna; her daughter Heather and husband Les; and her son Michael and ex-wife Tiana, and children Emily, Ben, Anni, and Neo (Omi). She is the beloved big sister of Ernie, Margaret, Marion, Blaine, Ronald, Glen, Edith, Norma, Norman, Lora Lee, and Barrie, and is loved by a raft of nieces and nephews on both sides of the family, and by her many friends. She is predeceased by her soulmate Les, her parents, her brother Bob, her infant daughter Cheryl Lynn, and her infant granddaughter Chloe. The family offers heartfelt thanks to Dr Nell and the extraordinary nursing team at the Boissevain Hospital, to Wheatland Funeral Service for their care and professionalism, and to the extraordinary community of Boissevain which has offered Anna Grace such a deep and sustaining sense of belonging throughout her life.